First Line: It was the moon that woke her, shining through the uncurtained casement window and flooding the attic bedroom with cold, pure light. Detective Inspector Kelso Strang is back to work from bereavement leave. Instead of staying in Edinburgh, his superior sends him off to the Isle of Skye as part of the new Serious Rural Crime Squad initiative. It's supposed to be a routine check on a missing persons report, but when Strang arrives and starts investigating, he knows there's a lot more going on... and that the woman is probably dead, not just missing. The missing woman happens to be the latest in the endless short-term merry-go-round of "housekeepers" employed by Adam Carnegie, the head of a charity called Human Face. Beatrice Lacey, co-founder of the charity, is the one person who may be able to shed light on Carnegie, but she is devoted to him and completely unwilling to give up her dreams of a happily ever after. One thing is certain: the missing woman tipped the first of a row of dominoes, and as each one falls, the danger mounts. Strang has his work cut out for him. 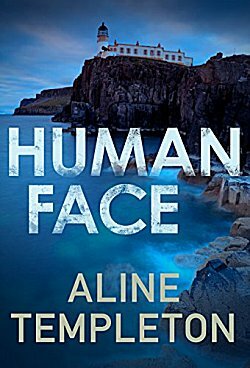 Aline Templeton is the author of one of my favorite crime fiction series, the DI Marjory Fleming mysteries set in southwestern Scotland. When I happened to stumble across the second book in this new Kelso Strang series and found out that the first book was set on the Isle of Skye (a place I love), I was all over Human Face like a rash. Kelso Strang is a very interesting main character. A sniper in Afghanistan then a member of an Armed Response Team on the Edinburgh police force, he was seriously injured in the automobile accident in which his beloved wife was killed. The only thing that has the power to keep him going is his job, but his team feels his mood is bringing them down, so his superior officer (who truly has his best interests at heart) settles on the missing persons report on Skye to keep him busy and his team in Edinburgh sweet. I really liked watching how this man approaches cases and the way he interviews suspects and witnesses because not everyone is what they appear to be, and the villagers are extremely reluctant to open up to outsiders (with the exception of the hotel owner who's responsible for most of the gossip). Strang is teamed up with local constable Livvy Murray, who is first seen as acerbic and lackadaisical, not really worthy of the uniform. One of the best things about Human Face is watching how Livvy transforms. She's not Wonder Woman by book's end, which would be totally unrealistic, but readers can now see her real potential. And it looks as though she may become Strang's partner in the series, which is another plus. In fact, this Serious Rural Crimes Squad is an excellent idea for a series because it will be able to take readers throughout Scotland to little-known places. Since I'm an armchair sleuth who absolutely loves Scotland, I can't wait! And in case you're wondering how well Templeton does settings, her brooding, atmospheric descriptions of the Black Cuillin towering over the village made the location a real character in the book. As much as there is to enjoy in Human Face, I didn't find it to be a total success even though the revelation of whodunnit was a complete surprise. There was a bit too much emphasis on the delusional Beatrice Lacey and the despicable Adam Carnegie-- to the point where I found myself thinking more than once "get back to Strang and Murray!" -- and in general, the book needed more editing and tightening. But as it stands, Human Face definitely makes me want to read more of Templeton's new series, and since the next book in the series, Carrion Comfort, will be released shortly, I know what I'll be buying. I may need to try this series, Cathy. I like the Templeton work I've read so far (not started this series yet) and the setting here is irresistible. Templeton is one of my favorite writers. I need to get caught up with her Marjory Fleming series.